Hi all, very new to coin collecting and have a quick question that i can't seem to find the answer to. Whats the differance between and error and a variety? I would say an error is some difference caused in the minting of the coin. A variety is a coin that has characteristics specific to the die pair that struck it. Most collectible varieties can thus be traced to a set of dies. The difference between the two (variety & error) is open to the collector of these anomalies. As a long-time variety collector, I use the way that Hans Zoell (look him up) described the difference between a Major and a Minor variety in his books. A Major variety was a coin minted on a good planchet, with good dies, with properly operating equipment and pressures, and struck with good, mint-approved dies. As such, different fonts, spacings, portraits, re-engravings, repunches, marriages, etc were included. I(and almost every serious variety collector that I know) use that definition for a "variety" and, as such, they can be found on every one of the coins struck by that die pair. 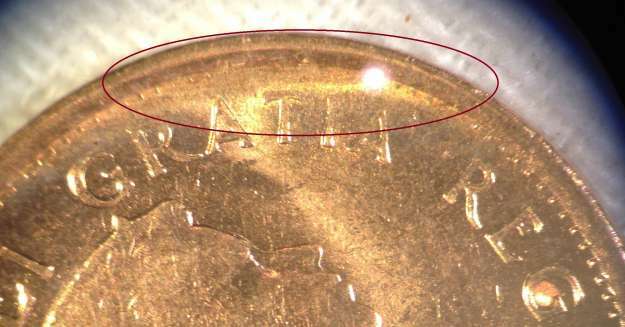 An Error, on the other hand, can be found on a single coin or any part of a mintage run of a die. Things such as die cracks, cuds, strike-throughs, laminations, plugged dies, missing design elements, and all manner of machinery-related wierd things, etc are then considered errors .. and Zoell considered them minor varieties in his books. The only malady that I consider a "variety", where it technically is an "error' would be Machine or Mechanical doubling, because it actually is caused by machinery not operating properly, but they look so neat and are so extraordinary that those with good offsets should really be called and collected as varieties. 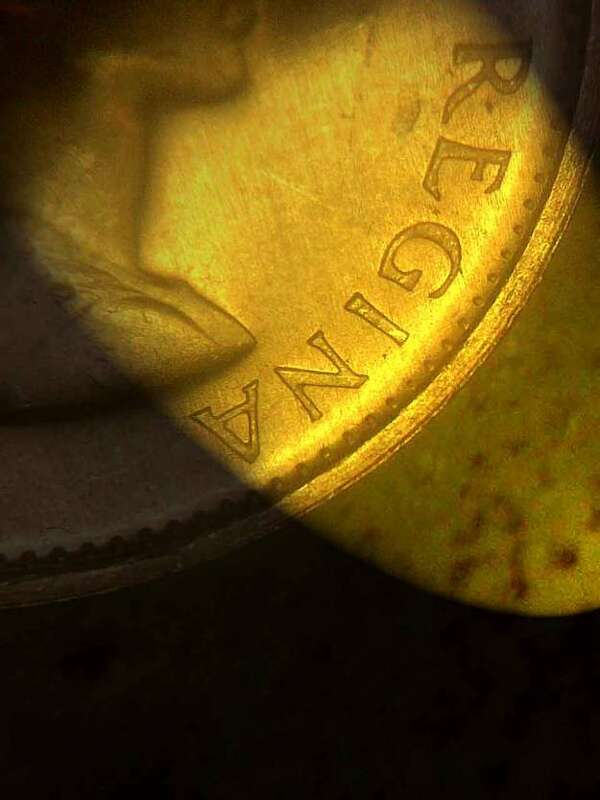 With enough magnification, almost ANY Victorian coin will show some doubling but they are well within the tolerance that was acceptable at that point in time. It really upsets me to see so many Ebay auctions touting "variety this" and "variety that" when they show coin elements with 40-60X magnification or flounting "die cracks" A die crack never is nor never was, a variety ... nor is something minutely offset in a design element. Thanks for the replies all. Thanks for the lengthy response bill. As I stated I am very new to all this and get quite overwhelmed sometimes trying to figure what is what! I have been going through some rolls that I have squired and have come across some errors/varieties and trying to decide what is. It'd worthy and what is not. I will post some pics tomorrow and maybe I can get some guidance. Thanks again all. So Bill your thoughts is a US 1922 plain cent an error are a variety? Since, evidently at the mintmaster's decision, they decided to not prepare enough dies for the 1922 cycle for Denver, they had to use a couple extremely worn Obverse dies. The 1922D "no" and "weak" D coins would be a variety, since all the coins struck with those dies would look esssentially the same. The mintmaster or the man on the floor OK'd using the worn dies so it's a good planchet, using good machinery with approved dies ... that spells variety to me. You need to be careful about peoiple removing the mintmark (or most of it) ... it's pretty easy. So what would cause this and would it be considered and error or variety? 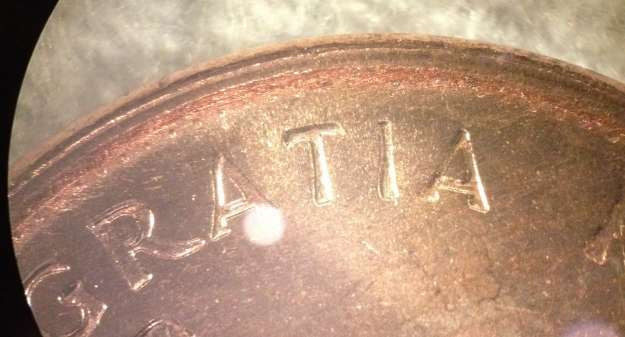 This part of the coin is missing beads and the letters are "faded". Because of the glare in the photo, I can't tell and it is also very hard to examine a computer pic and see what something is. It could be a 'strike-through', a bad die adjustment (where the 2 dies are not exactly parallel), it could be a weak strike, or it could be some kind of PM damage ... all would be errors in my book. 3 that the other side all have a having 3, double KG and a double last A in CANADA. Not sure if this is any better but have a look and let me know. There is still glare coming off the sides of ALL the letters, not just the last A. To me, it appears a little bit of mechanical or machine doubling where it will cuse a little shallow "shadow" of each design elemnt, with not as much relief as the main strike of the design. It is caused by the die being a little loose in the holder or keeper and the die will move (unidirectional or rotational) as the die releases from the coin ... in that millioneth of a second. Look carefully at each design element and see if there is a tiny bit of what looks like doubling evrywhere .. in some places it will appear to have more offset when the offset is further from the axis of the modified position caused by the loose die. Thanks again. I am trying different ways to take pictures of coins but not having a lot of success. I am waiting on a ring light to arrive and hopefully this will give more even light on my pictures. Yes there is a fair bit of doubling on this coin. Some of the letters and the queen as well. Seems to be a lot going on with this one. As I stated I found 3 like this so far out of 100 coins serched. I have 200 more to go through, all from the same mint bag.